An aquatic environment can boost cardiac efficiency, but pay attention to exercise guidelines. 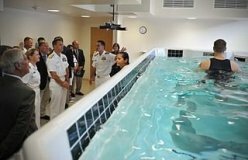 Before beginning a cardiac aquatic rehabilitation program, you should participate in at least 8 weeks of supervised land-based exercise to establish baseline measures for blood pressure, heart rate and angina. Your physician should consider arrhythmia history and medication side effects before providing a medical release. Look for a pool between 88 and 92 degrees F. Cold water can trigger arrhythmia; warmer water can impede heat dissipation. If you have a low vital capacity (less than 1.5 liters), the hydrostatic pressure of the water may make breathing difficult, so stay in shallow water or use a supine float. Keep exercise sessions short and intensity levels low; increases should be gradual. Take frequent breaks. Keep your target heart rate 12 to 17 beats per minute lower than an equivalent land exercise . Avoid horizontal swimming, which is too demanding for cardiac patients. Have a health professional monitor vital signs before, during and after sessions. Also, you should never exercise unattended. Stop exercising and alert a clinician if you experience pain or shortness of breath. Increased functional capacity or V02 max. : This is the maximal ability of the body to activate its energy systems to cope with the demands of exercise. Improved cardiac efficiency: increased tolerance for and practice of ADL, reduced heart rate, blood pressure, and rate of perceived exertion when exercising at submaximal levels. Increase in Myocardial Perfusion: improved blood supply to the heart muscle. Reduced CVD risk factors: reduced total cholesterol, reduced triglycerides, reduced resting blood pressure, improved control of Type 2 Diabetes, better control of body fat. Reduced symptoms of CAD: reduced Angina threshold, reduced pain. Improved psychosocial well being: reduced anxiety, muscular tension, reduced depression, increased self confidence, greater ability to cope with stress. American Association of Cardiovascular and Pulmonary Rehabilitation (AACVPR ) guidelines for Phase III/IV, patients exercising at 5 Met level. An emergency telephone should be within reach of the pool. Clients should bring their medications to class to a predetermined place. `Meds' should be labelled with the clients name and instructions. 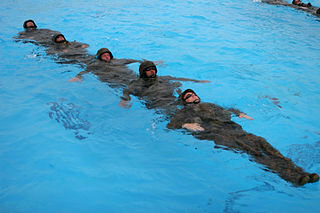 Slow warm-up to reduce possibility of chest pain and allow patients to adjust to aquatic environment. Low impact aerobic exercise increments with RPE and Heart Rate checks. Baseline HR, Peak HR’s, recovery HR. Blood pressures at least once a week or more according to patient condition. Use only one arm overhead when doing stretches and aerobic work (two arms creates a back pressure and stress on the heart). Intermittent long lever/short lever moves throughout workout. Keep RPE at 11-13 at peak exercise. 20-30 bpm above resting heart rate for peak exercise. For recent Exercise Stress Test results, use peak heart before ischemic changes (Ask the patient’s physician) as heart rate maximum; then calculate a straight percentage. 50 - 85% of heart rate max. Use 20 beats above resting heart rate is used if a patient is on a beta-blocker medication such as Atenolol. Use 10 bpm less than angina or chest pain threshold (For example: if a patient normally gets chest pain at a heart rate of 100, then make sure this patient does not exercise with a heart rate more than 90 bpm at peak exercise). Wait 6 weeks post heart attack before water exercise. Wait 3 months after coronary bypass surgery before water exercise. Patients are knowledgeable for monitoring RPEs, heart rates. 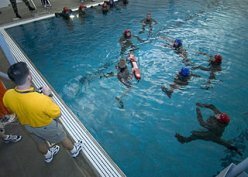 Guidelines on how to increase and decrease water workloads, working with hand buoys and webbed gloves. Observe for high B/P (blood pressure) with buoy work. Add toning/abdominal work with cool down. Jill M. Thein, MPT, ATC and Lori Thein Brody, PT, SCS, MS, ATC. Aquatic-Based Rehabilitation and Training for the Shoulder. J Athl Train. 2000 Jul-Sep; 35(3): 382–389. Choi JH, Kim BR et al. Comparison of Cardiorespiratory Responses During Aquatic and Land Treadmill Exercise in Patients With Coronary Artery Disease. J Cardiopulm Rehabil Prev. 2014 Nov 18.